Located at the end of Derby Wharf jetty opposite the restored Custom House in Salem Harbor. Salem offers plenty of history back to the days of the pilgrims. It is also well known as the site where the famous Salem Witch Trials began in 1692, where women and men were wrongfully accused to have been practicing witchcraft. The trials would ultimately result in the death by hanging of nineteen men and women, one man was crushed to death, and seven others who died in prison. Many more from surrounding towns were put in prison as well. Salem was once one of the most important ports in the nation. Famous author Nathaniel Hawthorne worked and lived in Salem. His book, The Scarlet Letter, depicts descriptions of the Custom House where he worked. In the early 19th century, the Custom House collected between 8-12 per cent of the nation’s revenues. By the time the Derby Wharf Lighthouse in Salem was built as part of a system of three lights, one other at Fort pickering, and the third at Hospital Point in Beverly, Salem Harbor had past its heyday as a major shipping and commerce center. Since the lighthouse sits at the end of a half mile extension of Derby Wharf, in the downtown area of Salem, there were no Keepers at the lighthouse, only caretakers who lived in the city to tend the lighthouse. 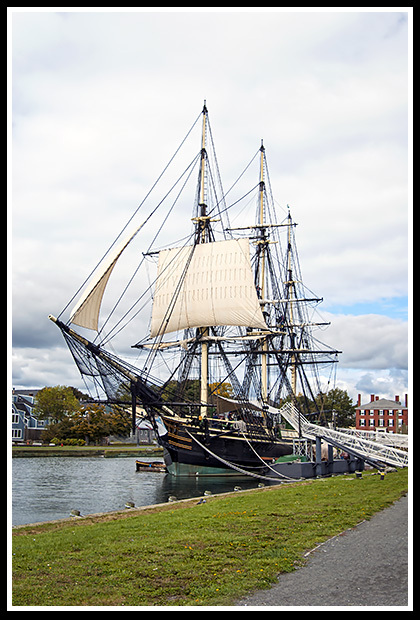 The Salem Maritime National Historic Site is a historic park offering marine artifacts and architecture from Salem’s early days as a major shipping port transporting cargo to and from its ports to Asia. Free ranger-led tours are available. One of the many historic architectural structures of the area include the Friendship, a 171-foot replica of an eighteenth century trade vessel, which visitors are allowed explore. 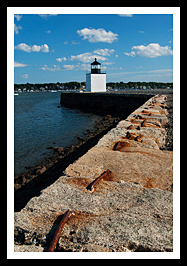 It is located at Derby Wharf, near Derby Wharf Lighthouse, which is flat half-mile walk to enjoy views of Salem Harbor. You can explore lighthouses in the area on the Schooner Fame, an 1812 replica of a privateer vessel, one that would be armed and would remove supplies from British merchant vessels. They provide 2-hour sails around Salem Harbor out of Fort Pickering. There are plenty of museums to visit in this historic area, like the Peabody-Essex Museum, which exhibits New England’s art and cultural history, and Salem’s House of Seven Gables, built in 1668 it is New England’s oldest surviving 17th century wooden mansion. The mansion inspired author Nathaniel Hawthorne to write his legendary novel of the same name and is located right next to where the famous author lived. Salem’s fame in its famous witch trials from the fears of witchcraft in the 1690’s that spread throughout the nation and Europe is told at The Salem Witch Museum. Take US Route 95 to Route 62 in Danvers exit and follow towards Salem. Take the junction to Highway 1A in Salem onto Derby Street. Continue following the waterfront signs. There will be parking garage before the waterfront to park at. The lighthouse can be seen at the end of the wharf to your right. Boat cruises mentioned below may offer many types of cruises. While some may offer specific lighthouse cruises, some will pass by Derby Wharf Lighthouse as part of charters, narrated wildlife and historic tours, fishing tours and other types of excursions. 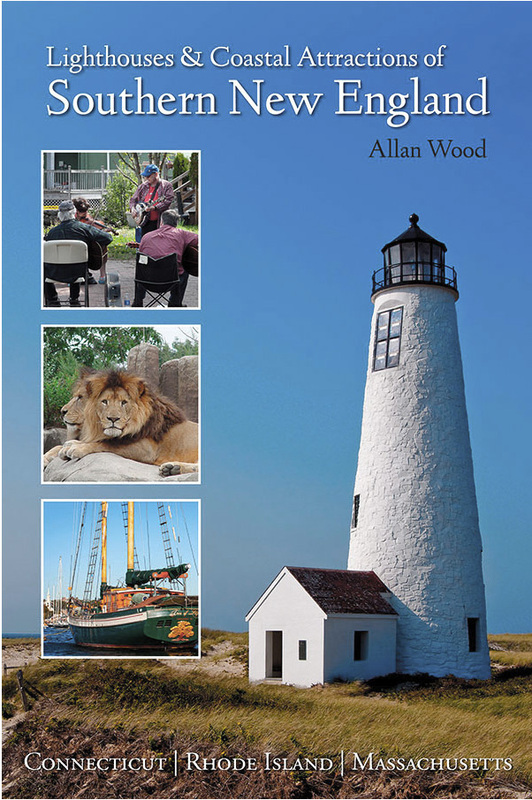 There you'll also find more Salem attractions, and over 360 images to enjoy.